Hey guys I'm Lancelot, and I'm new here. Technically, a friend suggested me to sign up here because he said that Gen I and Gen II hacking are your specialty. I have looked for GSC Scripting tutorials everywhere on the internet but I only end up getting all confused and some tutorials are set in the advance level which I cannot understand, a basic explanation on where to put 'this' and where to put 'that' will help. They're explained as simply as possible really. Unlike 3rd gen pokemon games, you can't input "script offsets" straight, you've to point to the scripts with the map editor you use instead. Anyway, if you can't keep up with what I wrote in that tutorial, you aren't used to the basics yet. please help him,we're making a hack.or if theres a free who can map or script a little,you are welcome to our team. Thank you very much!! I'll do my best to try and understand these tutorials. @amvz i could actually map for ya team. wow,really?well thats a big help! Uhm,please give me the informations about the tiles,like resolution,and number of colors,especially for buildings and houses,i want to devamp advance gen. Tiles and use in our hack.thanks! Could you repeat that? I don't understand what are you wanting here,so you want me to.. emm.. make you building and house sprites gsc style? nope, i will make the new designs for buildings,house,tiles,etc. using tiles of advance games,that I will going to devamp,and after I make tiles,(you said that you are willing to map for us)you will use those tiles for making the map. So i need informations of the tiles needed of Gold rom, like the resolution of tile(example 20x20 pixels),how many images for animated tiles,and number of colors needed(or the color limit). I hope you understand it now. all tiles are 8x8?meaning the buildings and houses are consist of 8x8 tiles?so is it posible to use gba houses and buildings here by devamping?by the way,thanks men. in the new bark town,the houses there seems to have more that 4 colors? each tile is assigned a pallet of 4 colours. each tile can have only 4 colours. The map blocks are made up of multiple tiles and therefore can have more than 4 colours because of that. Therefore the houses use 12 colours all total, but each tile only uses 4 colours. is it possible to use these tiles?thats the example output with my custom and devamp tiles. I will make more. Please check the colors on my sample. of course , nice tiles btw i like the trees but the grass isn't very appealing. as in mateo post it all must be the 128x48 i think , like all the other tilesets. assuming you can arrange it to fit in the same size image as I posted, and assuming each tile uses 4 colours (which it looks like they do, but you would have to edit some of the in-game pallets to match yours) then it should work. maps are made of blocks, which are made from 2x2 squares of those tiles. It is not like advance games where it is made of individual map tiles. ahhh... :( i'm actually on a complete stop right now on my hack. a lot of tools ain't working , cause i uninstalled my windows. what OS you running right now? xp, i had 7 but it lagged a lot , i think i'll stop hacking because of this - agixp and johtomap ain't working ,tileset editor ain't working either. haven't checked other tools if they work. that's strange. I run XP and all those programs run for me. what sort of errors do you get with them? the first error appeared on johto map , but for no reason now it works, out of nothing it started working.. i didn't do anything to it. the second appears on agixp. no further info. 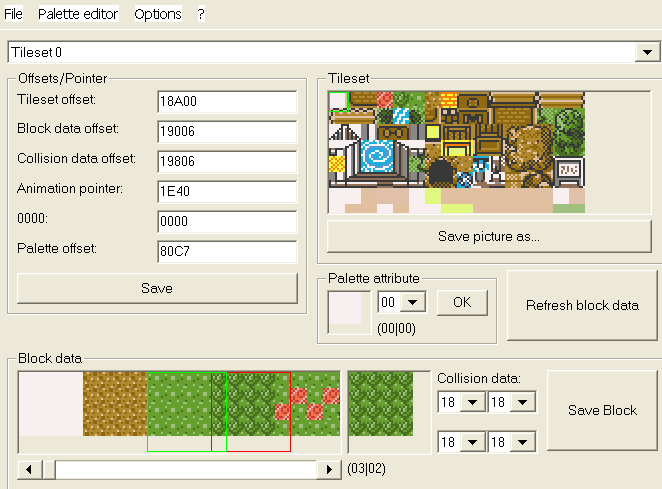 and for the tileset editor it seems that is it missing ''COMDLG32.OCX'' file. This contains comdlg32 as well as other files that some programs may require. Please don’t post .bmp files; they’re huge and take a long time to download. Convert them to .png first.